Google seems to be obsessed with speed. Of course that makes sense: between search, Youtube, Google Plus and everything else their servers spit out, those bits and bytes represent an incredible amount of traffic. Any improvement they can make improves user satisfaction and cuts their own servers loads. Speeding things up translates into less equipment needed and that is money in the bank. Google also nags website owners like me. 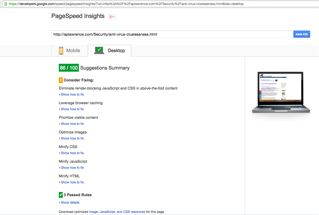 Their Webmaster Tools site measures our pages speed and ranks it. That's probably enlightened self interest too. Many of us run their Adsense ads; slow pages annoy users and that affects revenues. They also may eventually use speed as a ranking indicator. They say they don't now, but speed is plainly on their minds. Enter QUIC (Quick UDP Internet Connections). QUIC adds reliability to UDP without the overhead that TCP imposes. It doesn't require changes to routers as they just see UDP traffic. QUIC is already in use by Google since 2013. If you are using Chrome, you can see that with chrome://net-internals/#quic and by installing a Chrome extension that will show an indicator when a site is using QUIC. That's where it sits right now, but it may well spread to sites like this in time. What will it take to implement this on your site? Maybe very little effort at all. For example, right now I use Cloudflare here. They provide SPDY (another Google "speed things up" protocol which will soom become HTTP/2) for me automatically and I assume that as QUIC becomes more popular they may do the same for that. That would mean I'd need to do nothing at all other than turn it on at Cloudflare. See Staying up to date with the latest protocols.